Small, weird-looking smartcars are nothing new; there are plenty of them on the road, especially in cities where space is at a premium. But Toyota has launched something that makes great use of its zippy 3-wheeled i-Road vehicles: a new car-sharing service that integrates with a city's existing transit system. The concept is basically a sort of bikeshare/Zipcar hybrid, meant to supplement existing public transit systems. You can reserve a nearby car ahead of time if you want by using an app on your phone, but you don't have to take it back where you originally found it at the end of your trip. The kiosks also act as charging stations for the vehicles to make sure they stay juiced up. 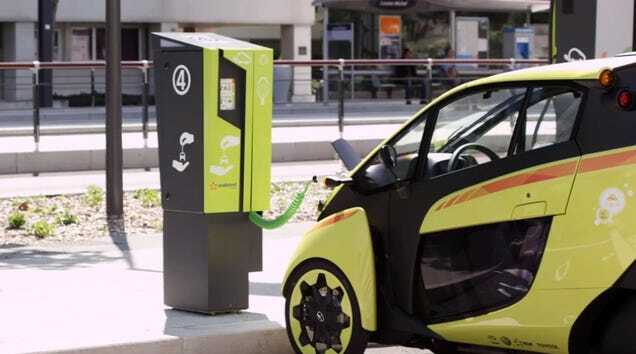 After being tested in Tokyo earlier this year, a pilot program named Cité lib in partnership with Japan-based car-sharing company Ha:Mo has rolled out in Grenoble, France, where residents can rent one of 70 cars from 29 stations across the city. Not only do these small EVs make more sense, logistically, than a full-sized gas-guzzling car for the one person who simply needs to get from the tram station to work, the new system also helps make the idea of car-sharing more convenient and palatable. Zipcar and other traditional car-sharing systems (which Grenoble already has) are pretty easy to use, but these are visible and well-branded, more like an extension of the transit system. With enough of these in place, people would start to see how they might replace their own car (plus, imagine never having to worry about parking). As far as what resident are paying, Cité lib charges as little as 3 Euros for a trip less than 15 minutes, although you still have to sign up for an annual pass to use the service. The concept is also a smart move by Toyota. Car ownership is not the gold mine that it once was, thanks to people ditching their cars as they move into more urbanized areas. If cities are willing to invest in fleets of these shareable vehicles, that's a good place for the automaker to position itself. GM's already getting into the game with its shareable, stackable, and eventually completely autonomous EN-V. Toyota's system already has the car-sharing infrastructure built in.